A recently discovered coffin showed the captain was buried on 23 July 1814. The dig began in October – one of 60 archaeological sites between London and Birmingham being explored prior to the construction of the £55bn high-speed rail line. It was known Captain Flinders was among the thousands of people buried at the site, which was built over when Euston station was expanded in the 19th Century but it was unclear whether his body or others would be able to be identified. The discovery so early in the dig has thrilled archaeologists who were not confident they would find Captain Flinders among the 40,000 people interred there, HS2 said. They were able to identify his remains by the lead breast plate placed on top of his coffin. Captain Flinders, who was from Lincolnshire, made several significant journeys, notably as commander of HMS Investigator. In the ship he became the first known person to navigate around the entire coast of Australia, confirming it as a continent. He is also credited with giving Australia its name – although he was not the first to use the term, his work popularised its use. You don’t need to go far in Australia to find the name Flinders. Streets, stations, mountains, towns, a river, a reef and a university all carry the captain’s moniker. But the man credited with mapping this vast country and identifying it as a continent also has a lesser-known legacy. 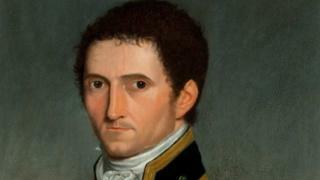 Matthew Flinders also found time to write a biography of Trim, his ship’s cat. Trim survived storms, a fall overboard and a shipwreck before, according to Captain Flinders, eventually being eaten by starving slaves in Mauritius. There is even a statue in Sydney to celebrate Trim, and the obvious affection shown to him by his intrepid, seafaring owner. The headstone marking his final resting place was removed following the expansion of Euston Station into part of the burial ground in the 1840s, and it was thought his remains had been lost. Helen Wass, HS2 head of heritage, said: “The discovery is an incredible opportunity for us to learn more about the life and remarkable achievements of this British navigator, hydrographer and scientist. “Given the number of human remains at St James’s, we weren’t confident that we were going to find him.